Curious George 3 Back to the Jungle DVD Giveaway! Independence day is a time for fun, parties, and barbecues with family and friends. It’s the day we can cover our homes in red, white and blue to share our love for this country and the best barbecue day of the year. It is also a great opportunity for us DIY crazy crafters to make fun party favors all our friends can enjoy. If it is a little overwhelming and the creative juices are just not flowing, don’t worry, orientaltrading.com has created a great party favor tutorial for Patriotic Parfait Candy Cups. The above ingredients can all be purchased on Amazon.com. The candies can be substituted for any red white and blue candies. The ribbon and stickers are also suggestions since anything patriotic works. The Plastic Champagne lasses are a must to pull off these beautiful centerpieces/ party favors. 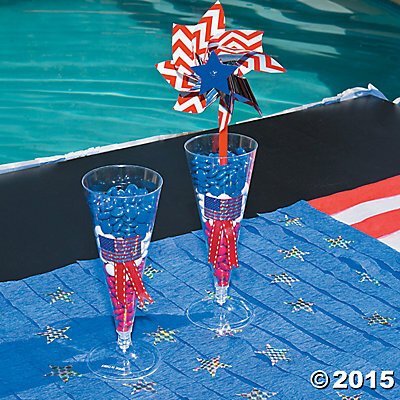 Let you DIY crafter side fly and make these your own with red, white and blue flare.